Next time you visit Grand Canyon, you might find it to be even more beautiful with man-made waterfalls, landscaped canyon walls and topiaries along hiking trails! A recent survey conducted by My Federal Survey Inc., an independent marketing research firm, found that the long-time decreasing numbers of visitors to the Grand Canyon National Park was due to the park’s lack of anything worth seeing or doing. In response, Grand Canyon’s Superintendent, Christine Lehnertz, decided to use some of the money received from entry fees to help make Grand Canyon more appealing to the average tourist into something people may actually enjoy instead of trail maintenance, infrastructure upgrades or wasteful archeological projects. Park rangers have been working day and night with landscape architects in creating something even Walt Disney would be in awe of. 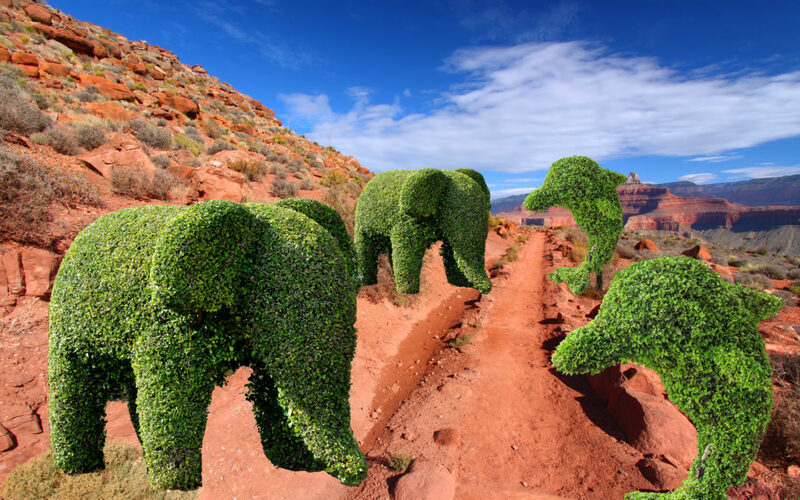 Grand Canyon now has various topiaries along South Kaibab and Bright Angel Trails is the shape of squirrels, bunnies, elephants and dinosaurs. Soon, the park service will add 2,000 Palm trees to various places along the same trails and the Colorado River. Half the cacti will be removed and replaced with more shapely topiaries. Since the precipitation in Grand Canyon is only about 8 inches per year, a water recycling program has been initiated, using sewer water to irrigate the new vegetation. The South and North Rims will see more clean up of pine cones and needles and additional lawn up keep – raking the forests like the Finnish people are know to do. Once this project is complete, the park service will add the very items that makes a park a park – amusement park rides! There is such a waste of real estate and fun at these parks, so get ready to take a free fall ride that drops you from the rim of Grand Canyon to the bottom (which is already present but it usually takes a push to get you off the edge).